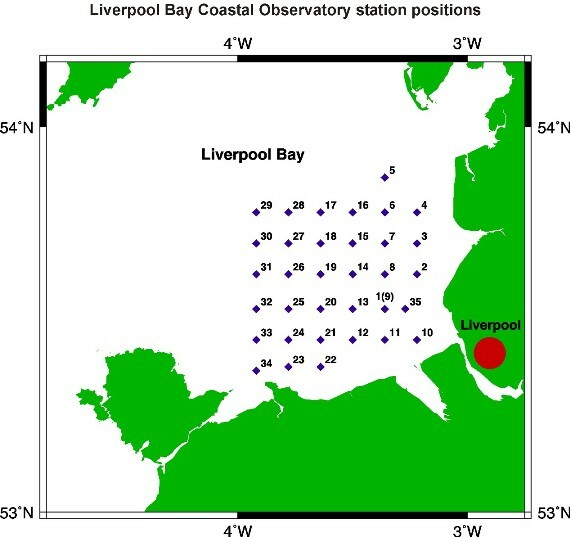 Sea-Bird MicroCAT 02081 5 m Comparisons performed against CTD data suggest a possible drift in temperature and conductivity towards mooring recovery, however as the data from this instrument are consistent with data from other instruments present at this site, no adjustments have been made to the data. Aanderaa RCM 10526 10 m CTD comparison checks led to the Originator converting all conductivity cycles recorded after 2005-06-23 12:05:00 UTC into absent data values. Spikes present at cycles 675, 949-950 and 952-954 have also been converted into absent values in the conductivity channel. After comparing these data against the other instruments at this site, an offset correction of -0.02°C has been applied to the temperature channel. Sea-Bird 16+ SEACAT fitted with Seapoint Turbidity Meter 10471 04597 Located on seabed The data from this sensor are of good quality. There is a possible drift in conductivity at recovery, but as there is a good match between data from this instrument and CTD data at mooring deployment, no adjustments have been made to these data. Teledyne RDI 600 kHz ADCP 3644 Located on seabed To correct for the magnetic declination (difference between magnetic north and true north) latitude values were changed by -4.0033°. All latitude values were modified by +1.3348° to correct for the compass error. Sea-Bird MicroCAT 02506 5 m Comparisons performed against CTD data at mooring deployment and recovery found no offset in temperature at deployment, however the values had drifted by mooring recovery. There was an offset of -0.0070 S m-1in conductivity at mooring deployment, and the conductivity had drifted even further away from the values recorded by the CTD by mooring recovery. The conductivity channel has been adjusted by the minimum offset observed in this series, leading to an offset correction of +0.0070 S m-1 being applied. Sea-Bird 16+ SEACAT fitted with Seapoint Turbidity Meter 10489 04737 Located on seabed Good quality temperature data were recorded by this instrument. Deployment CTD checks revealed an offset of -0.0054 S m-1 in conductivity, as well as a slight drift towards recovery. An offset correction of +0.0054 S m-1 has been applied to these data. Teledyne RDI 600 kHz ADCP 2391 Located on seabed To correct for the magnetic declination (difference between magnetic north and true north) latitude values were changed by -4.1164°. All latitude values were modified by -6.1267° to correct for the compass error. This rig is a single line mooring, comprising a surface CEFAS SmartBuoy along with a Sea-Bird MicroCAT and an Aanderaa current meter attached at depth on the mooring line. The single point mooring was composed mainly of half inch long link chain, marked at the surface by a 1.8 m diameter toroid (the CEFAS SmartBuoy) and anchored by a half tonne clump of scrap chain. The CEFAS SmartBuoy is fitted with a surface CTD (including turbidity and fluorescence sensors) and a water sampler which obtains water samples once per day for laboratory nutrient (nitrate, nitrite, phosphate) determination. In addition A Druck 5 bar pressure transducer, a battery monitor and an analog roll / pitch device were attached to the buoy. The CTD and light data are transmitted back to CEFAS via Orbcomm. Conductivity 10 minutes Upon recovery the clock was found to be running 5 s fast. Pressure 10 minutes Instrument malfunctioning; see problem report. No fin; used only to log temperature (low temperature setting) and conductivity.